A decision which you will have to live with for really long time is the decision of choosing a best domain name for your blog or website. There are so many questions which will eat your mind when you will even think about registering a new domain. 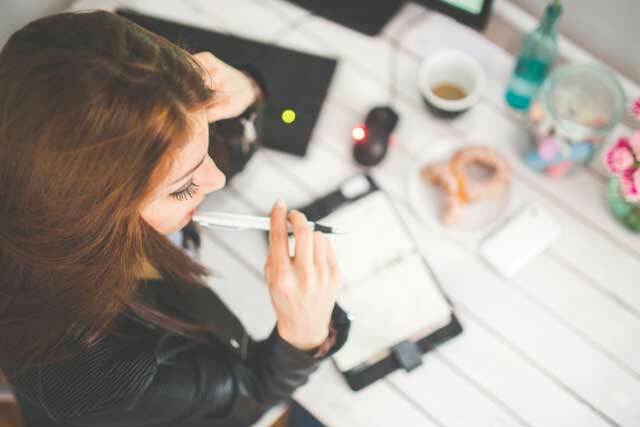 The first thing, when you are about to start an online business website or blog, choosing a domain is the step which can make you eat out your own head. Choosing a domain name is one of the really crucial and important steps in the success of a blog or any online business. Domain name is not just an address of a blog or website but plays an important role in the success of any online business. It is the online identity. Domain is what makes your brand recognizable and help it to become a brand online. Some popular examples of domain names are Apple.com, Amazon.com, Change.org, eAskme.com, Facebok.com etc. Domain Name Keyword grab more than 14,10,00,000 results in Google search. This shows that Domain name is not just an important factor for the success of an online business but also there are so many businesses which are providing domain name service. There are various questions which come in your mind or mind of some on else who is thinking about a great domain name. Today I am going to A complete Domain Guide to share each and everything about domain names which will help you not just to understand how to choose a domain name but also helps you to know why domain is important and how it will help your blog to become a brand or your online business to become a brand. 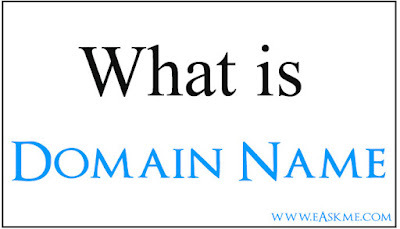 Let`s start with basics of domain name. Domain name is not just the name of the website; it shows the type of website and represents how your blog or website will be known online. Domain name is an online unique address of your site. You can keep it as long as you are paying annual fee of the domain to domain name registrar. Domain is the Url for users as they type it in web address and hit enter to reach your website. Search engines also use your domain to crawl and index your blog and it`s content. Choosing a domain name is really important. It make the users find out what is your site all about and it`s your domain which becomes a brand online. It is important that you choose a domain name about your online business carefully. You may spend weeks eating your brain and burning your eyes to look for a perfect, unique and easy to remember domain name for your blog or website. Why Domain Name is really important for a website or blog? When going online, domain name is the very first thing which grabs the eyes of a visitor online. Where a good domain name brings trust and confidence, a bad domain name can destroy the reputation and bring more harm. So now in this domain name guide we will see why it is important? For branding, it is must that your domain name and business name should be same. Not only domain names, but domain name extensions also plays an important role when it comes to rank higher in Google search or Bing search or any other search engine. Now let`s understand structure of a domain name. It is realy necessary that you should understand the domain name structure in this domain name guide. In above domain name structure you see that there are various things which complete it. Let`s understand these. For a domain prefix shows that internet protocol of your domain name. HTTP stands for HyperText Transfer Protocol. This shows how data is transmitted and formatted. It also shows the talk between browsers and web servers. Sub-domain is a subdivision of a domain. It shows at the place of WWW. It always works with primary domain. For example: in http://whatisthis.eample.com, whatisthis is a sub-domain. This is the name that you register online. When you buy a domain name you will find one domain in two versions. 1) WWW : http://www.easkm.com is a domain name with www. It is always recommended that you verify both domain names in Google Analytics to make search engine understand that you are the owner of both versions and use Canonical tag to show that the content is not copied it is just the same domain with both versions. Choosing a domain name extension is as important as choosing a domain name. Always choose a Top Level Domain extension (TLD) for your blog or website. It is located after the . of domain name. 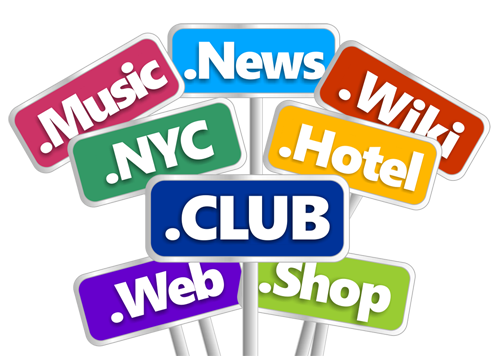 There are various TLD`s available online. As I have already mentioned, Choosing a domain name extension is as important as choosing a domain name. It is always recommended to choose a Top Level Domain Extension (TLD). There are 1500+ top level domain extensions available for you to choose. Because they are not the oldest extension, but the most popular domain name extensions also. For example .Com, .net, .org etc. 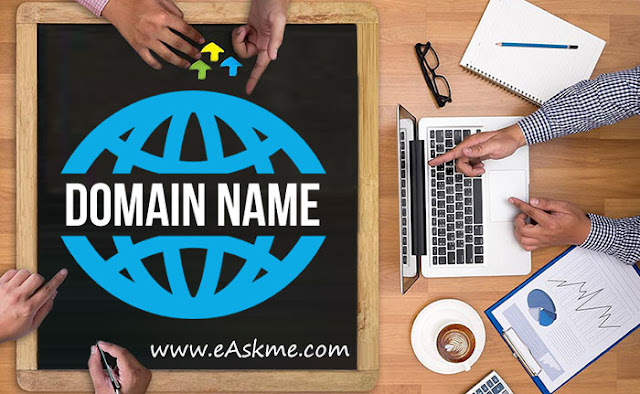 There are times when you might not be able to find the domain name you are looking with Original Top level Domains extensions, at that time you can even go for the second type of TLD`s. These are country code top level domains. .us (USA), .uk (United kingdom), .in (India), .au (Australia), .jp (Japan), .cn (China), .ca (Canada), .ph (Philippines) etc. You can even choose a generic top level domain for your business site. Generic domain shows the type of business as they represent the name of the business. Examples of generic top level domains are .agency, .accountants, .business, .digital, .city, .social, . photography etc. List of 1526 Top Level Domain Extensions. 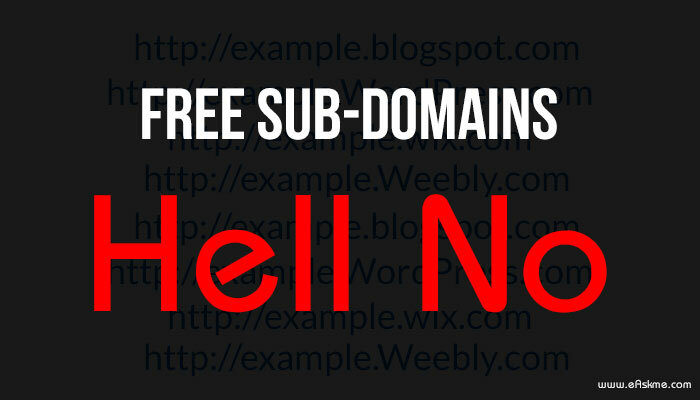 Why you should not go for free subdomains? I have seen many times that people send me their blogs with free sub-domains such as example.blogspot.com or example.wordpress.com. Free is not always the best option. Why choosing a sub-domain is not a good decision? 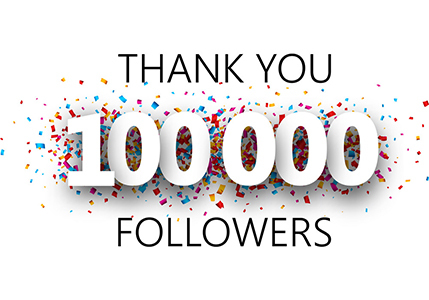 When you are choosing a free sub domain from blogging services, you actually giving the full control of your content to those websites, which are proving free sub domains to you. It is also not good for branding as no matter how much you promote it, it only help the main domain to become a brand. What to do instead of choosing a free domain name? You should always choose a custom domain name. As this give you full control over the domain name. You can even add your own subdomains. It is also not costly as you can choose it on very low price for a year or 2 years or five years or 10 years. Why you want a domain? What is the topic of the blog? What style and tone your site or blog carry? What is domain name structure? What are the top level domain name extensions (TLDs)? 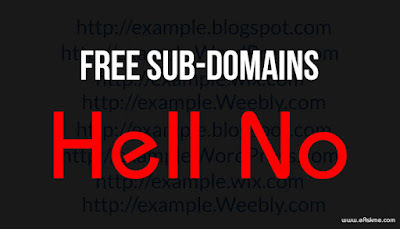 Why you should not go for free sub domains? Now it is the time to understand what factors to consider when choosing a domain name? When you want to buy a domain name the very first thing is that you should consider choosing a unique domain name. Choosing a unique domain name is really necessary ot make your blog a brand. If you want to market yourself like John Chow then you can choose a domain name mix of your first name and last name such as JohnChow.com. It is not that bad to choose a domain name with your own name but if you are trying to build a blog or run an online business then choosing a domain name with your own name is not a good idea. The very first step is that you should try to buy a domain name similar to your business name. You can do a domain research on Google or on domain registrar service to find out if the domain your are looking for available or already registered. All one word domains have already been registered. So you might not be able to find one word domain name for your blog. In such a case you should use a mix of two or three words to find the best possible solution for your domain name. The most common mistake which mostly people do when choosing a domain name is buying domain names with fancy and wrong words. You should always think that if a common person can`t remember the words of a domain how can he/she type that domain. For example : If you want to buy techtricks.com, but you see that domain name is not available for purchase or domain is already registered, than you buy a domain name such as techtrikz.com. Now you see techtriks.com and techtrikz.com both sound similar, but when you tell someone that you have a blog or site name techtrickz.com, they will always remember and open techtricks.com. So unintentionally your mistake will lead the other site get more traffic. Instead of that is you buy alltechtriks.com, this is really easy to type and easy to remember. I am sure you do not want to do that mistake. So it is always good that you try various combinations and buy a domain name which is easy to remember and easy to type. It is always recommended that you should use the target keyword in domain also. If you want to start a blog or a micro niche blog than using keyword in domain is really helpful to rank higher as compare to those who are not using keywords in domain name. Have you thought for a second that when someone tells you that he has xyz site, you automatically put .com in the end of it to open it. Now you know that .Com is the extension which is widely living in the minds of every common person. When you say a website the first thing which hit the mind is .Com. Over 75% sites worldwide using .Com extension. It is always the most recommended Top level domain extension. It makes the domain easy to remember. But what is .Com is not available for your domain. In such case you should go for other TLDs or ccTLDs or gTLDs. Domain name is your brand online. A brandable domain name is a domain which speaks for itself. It tells what the site is all about. For example: Domain iOSCrunch.com shows that it is related to iOS and its updates. It is also an easy to brand domain name. You can even look at the top 100 brandable domain names shared by DailtTekk. A short name is always easy to remember. But it is not easy to find short names, if that you case you can go for a mix of two or three words domain. Never use acronym as for a common person it is not easy to remember acronyms. The biggest fatal error is trademark issues because of domain name conflicts. When choosing a domain name it is always recommended that you should check trademark terms here to avoid any trademark issues. Do you know that trademark issue can kill your website or blog and take down your online business? For example: If you use Facebook in domain name, it is direct violation of Facebook and company can sue you. It is not easy for a common person to remember the use of hyphen and numbers. For example if you tell a person that you have a domain name abc-xyz.com. People always type abcxyz and forget hyphen. In case if you say that if you have a domain name abc2xyz, people will always type abctoxyz. So it is not easy to them what you want to say. It always confuse users and misguide them to visit some other sites. I have seen many newbie bloggers and businesses fall for the latest trend domains, but they forget the fact that trends always change. So when the trend changes their domain becomes unattractive. IWiring evergreen content is important but choosing an evergreen domain name is mush more important than that. Do not make any mistake while choosing a domain name. Many peopel choose a domain without thinking professionally or without doing any research and after sometime they find that domain is not that attractive or informational or a best representative of their business. You cannot rename a domain, the only thing is to replace it and if you replace the domain all your efforts, time and money you spent on domain earlier will be lost. 12) What Social Network Tells? In this domain name guide I also like to mention that when choosing a domain name you should also check it`s social influence of people. Always go fr the domain name which is easy to brand and can easily make it place on social networks. You can also use Knowem tool to check the brandability of a domain name on social networks. What factors you should consider when buying a domain name? 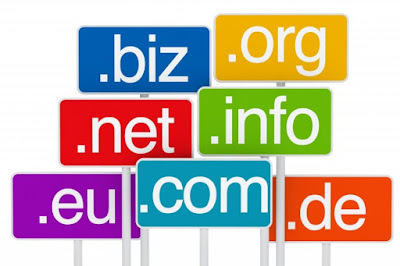 As now you understood what prechecks or factors you should take care of when you are about to choose a domain name. You can easily check the availability of domain name by searching them on domain name registrar sites. If the domain is available then you can purchase it and if it is not available in any extension that you want then you can try using mix of keywords that you want to target. You can even use the domain name suggestion tools or domain name generation tools to choose the best suitable domain name for your blog or website. Finding a domain name that you want can be really hard if the domain you are looking for is not available. In that case domain name generation tools help you. Here I am sharing the list of most popular domain name suggestion tools for you. After finding the best domain name for your site or blog, the next thing is actually buying a domain name. How to Buy a Domain Name for your blog or website? Now you have a domain name which you want to buy, so let`s do it. There are various popular domain registrar`s which help you to easily buy a domain name from ($10-$15 and sometimes under special discount). There are popular web hosting services which also help you to get a free domain name with web hosting. You can even buy a domain name from one registrar and buy web hosting from other registrar and update nameservers to connect them. Some domain registrar also offer your business emails which is good. There are numerous domain name registrars available, But I recommend you to buy from the relabile registrar`only. You can even start your own domain and Web Hosting company. I must say that when you want to buy a domain name, the domain name registrar must be accredited by ICANN. ICANN is a non-profit organization which helps you to understand the functions of domain names. You should also check the proce and top level domain extension. When you buy a domain name and hosting from two different registrars then it can cause you to do some extra steps to connect your domain name with web hosting. Connecting domain name with hosting using DNS records is easy and anyone can do it. Enter the name you want to buy in domain name box. Search for the available domain and add to cart or click to buy. You will successfully register a Domain name and get domain name confirmation in your email. These are the common steps that may very from one domain registrara to another. Now let`s talk about Premium Domains. Premium domain name is usually known as the domain name with very high value. Premium domain names are already owned by domain registrar or some other companies because of high values of thes type of domains. Companies and registrars sell Premium Domains on very high rate from thousands of dollars to millions. There are the domains such as yatch.com, travel.com, beer.com, hotel.com, seo.com etc. has been sold for millions of dollars because of their easy to brand nature and higher values. How to buy a premium domain name? As I have said premium domain names are under the ownership of registrars or companies which sell these domains on very high rates. The very first thing you can do to buy a premium domain name is to search on domain registrar to find out if the domain is available with the domain registrar or not. If it says that domain is available then you can buy it. Otherwise, you can check the domain name by entering it in web browser and it will displays a page from the seller of that domain. You can contact them to buy that domain or to know the price. You can even look the premium domain names in the domain auction services like Sedo, Namejet and Godaddy Auction. You can go there, make the deal and buy domain. What if the premium domain you are looking for not on sale but only reserved by the owner? How can you buy domain in that case? In this case you can check the contact details of the owner running Whois search. In many cases you will find the information such as phone number, email id and address. You can contact them to find out if the domain is available for sale and make your offer. You can even use the service of a domain broker to find the best premium domain on best possible rates for you. I call it premium check because it shows that how good a domain is for you. You can check the domain seller history, his social profiles and how trustable that person is. These things will help you to negotiate and make your deal. You should also check the availability of social profiles using Knownem.com. It is not good to buy a domain name if social profiles of that domain are already taken. Buying a premium domain is not an overnight process. It takes time as seller and buyer never reach on the common price in one go. There can be a long negotiation talk. Also you have to do all history check to make sure you are not doing any mistake. Get the written agreement to legally bind the terms. You can use Escrow to complete the deal. 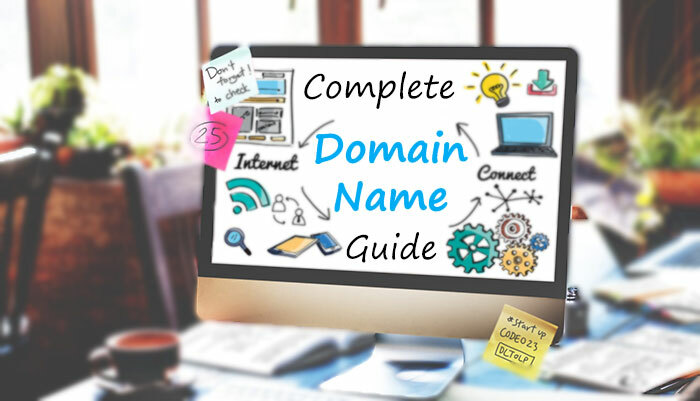 In this domain name guide I have clearly mentioned it that how important is it for you to choose a domain name and what steps you should take when buying a domain name. It is a really crucial steps and this domain guide will help you to choose domain carefully and a domain which is easy to brand. Never do hurry, when buying a domain. Always consider above given domain factors and follow the rules to buy a domain which help your business or blog to be successful. After reading this domain name guide, If you have still any question about how to choose a domain? or how to find best suitable domain name? or where to buy the domain name you are looking for? Feel free to ask me via comments. I really like to answer your questions. It took me over 5 hours working on this domain guide to help you to understand what you should do when buying a domain? Sharing is caring and I really appreciate if you like to share this domain name guide with your friends on your social networks.